Keystone Wood Specialties Inc. was recently recognized throughout Pennsylvania as one of the “Best Places to Work in PA” (BP2W) for 2005. We were among the top 100 companies in Pennsylvania, and we were honored to achieve the ranking of number 15 out of the field of 50 companies in our size category. 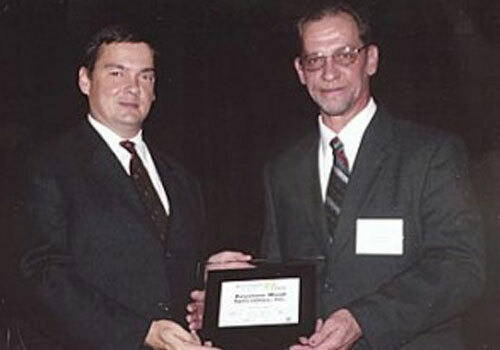 Keystone’s placement rank was revealed at the Best Places to Work in PA Awards Ceremony held on the evening of November 29, 2005, at the Hershey Lodge & Convention Center in Hershey, Pennsylvania. Company President Sam Stoltzfus and his wife Elaine, and Safety/Compliance Coordinator Dave Landis and his wife Bobbie were there to recieve the award. The Best places to Work in PA” is a state-offered “survey and award” program, that was created in 2000.Oone of the first of its kind in the country, it was designed to identify and honor the best places of employment in Pennsylvania, benefiting the state’s economy, its workforce and businesses. Award recipients are made up of 100 companies split into two groups: 50 medium-sized companies (25-250 employees) and 50 large-sized companies (more than 250 employees). Keystone was named in the “medium” category. • Be in good standing with state agencies. The nomination process had two parts. The first, comprising approximately 25% of each company’s score, consisted of evaluating workplace policies, practices, philosophy, systems, and demographics. The second part (75%) was the result of confidentially administered surveys the empoyees filled out. The combined scores determined the top companies and their final ranking. Nearly 20,000 Pennsylvania employees filled out the survey. Big issues, such as a safe work environment and employee benefits, to the smaller details such as free coffee each day, or the fact that Sam makes it a point to try and greet each employee some time during each day, many Keystone employees think of their job as a true blessing.